Travel & Leisure Group will be celebrating their 25th year of business at the Destinations Show 2017. 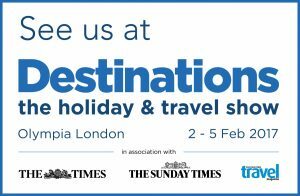 The international timeshare resellers will once again be exhibiting at Destinations: The Holiday and Travel Show, February 2-5 at Olympia London. Attendees can discover a wealth of information at the show, and it is ideal for anyone seeking travel inspiration. Expertise comes from reputable industry professionals, including both travel and timeshare companies. Travel & Leisure Group will put private timeshare sales front and centre at the Destinations Show 2017. Our experts will be on hand to answer all of your questions and make a recommendation or two. Unsure of what you want this year? Then we are your ideal assistants! You might be considering the culture of Paris or Rome. Alternatively, you could be looking at the beaches of Spain or Thailand. You might even be looking for the excitement of the slopes in Colorado or Andorra. No matter your holiday needs, we can put a wide range of options in front of you. Furthermore, they will often be off the beaten path; consequently, you can make your own discoveries! Why Visit the Destinations Show 2017? The Destinations Show 2017 has a full roster this year. Visitors can meet with hundreds of tour operators, tourist boards from around the world, travel celebrities, and much more! Indulge your passion for travelling by attending the largest choice of exhibitors in the country. There are also various panels and theatres taking place. Talks, panel sessions, and presentations from leading travel writers will be available at the Stanfords Travel Writers Festival. Four Experience The World stages will bring to life exotic cultures through performances and food and drink tastings, giving attendees the chance to see the world from London. Over fifty hours of travel advice will be available at the two Meet the Experts Theatres. These theatres will cover journeys for every continent and give endless inspiration to visitors. For more information, visit our Exhibitions page or the Exhibition website. We’ll see you at stand E150! Travel & Leisure Group oversees timeshare resales across the world. We enjoy a respected, unrivaled reputation as one of the leading timeshare resale brokers in Europe. Because of this, we’re the only authorised reseller for Diamond Resorts Points (DRI Points) and a recommended reseller of many other developers. Travel & Leisure Group is a member of RDO, TATOC, ARDA, and C.A.R.E. Therefore we can guarantee that you’ll be in safe hands!